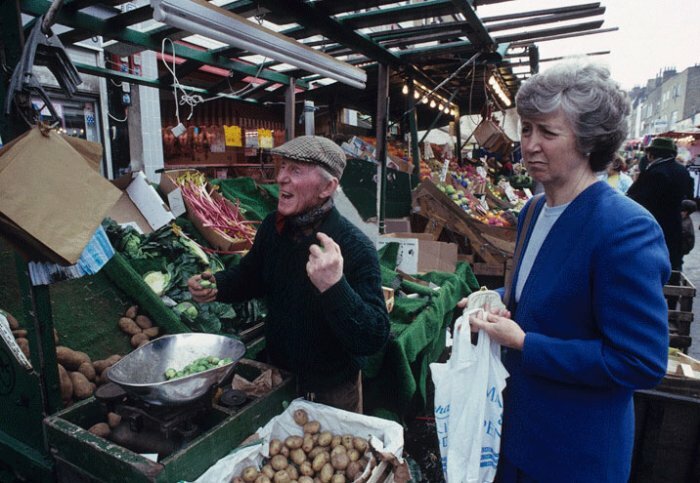 Oswald ‘Columbus’ Denniston, Brixton Market, SW9. Photo © David Secombe, 1990. These street-folk present perhaps as great a diversity of character as any of which I have been called upon to treat.Among them are the strong persevering men, who carry rolls of linen or cotton manufacture in packs on their backs, and trudge along holding a yard-wand by the middle, which – it is a not uncommon joke against them – is always worn down an inch or two, by being used as a walking-stick in their long pedestrian journeys. Some of these men love to tell of the many hundreds of miles they have walked in their time, and in the three kingdoms. Oswald M. Dennison – the first of 430 job-seeking Jamaicans to land at Tilbury yesterday morning from the trooper Empire Windrush – started a £4-a-week job last night. Wrapped in two warm blankets to keep warm, he settled in as a night watchman of the meals marquee in Clapham Common, SW where 240 of the Jamaicans are staying in deep wartime shelters. All of them sat down there to their first meal on English soil: roast beef, potatoes, vegetables, Yorkshire pudding suet pudding with currants and custard. A bed and three hot meals will cost them 6s.6d (32.5p) a day. Most of the Jamaicans have about £5 to last them until they find work. Oswald Dennison, 35-year-old sign painter, got his job after making a speech of thanks to government officials. He called for three cheers for the Ministry of Labour and raised his Anthony Eden hat. Others clapped. Panamas, blue, pink, and biscuit trilbys and one bowler were waved. 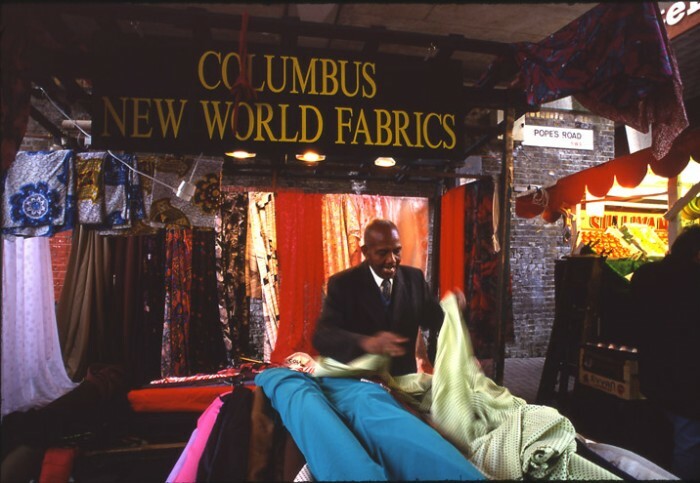 When this picture was taken, Oswald ‘Columbus’ Denniston was a sprightly 76, and had been selling fabrics in Brixton for nearly thirty years – the first Afro-Caribbean trader in Brixton market. 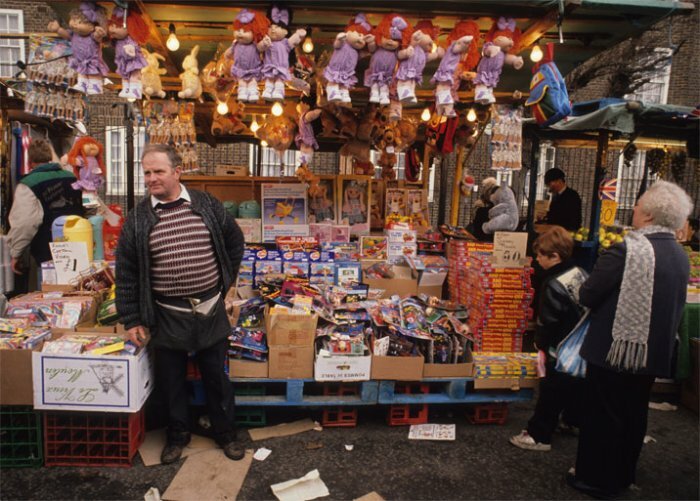 The photo was commissioned for a Sunday Times Magazine article on London street traders (which never appeared as the ‘London’ section of the magazine folded before the feature was published). By this time in his life, Oswald Denniston had become a potent symbol for the black community in London, his manifest virtues of charm, capability and decency commanding widespread fondness and admiration. The quote from Mayhew seems appropriate here, for surely no-one has ever travelled so far to sell fabrics as Columbus Denniston. 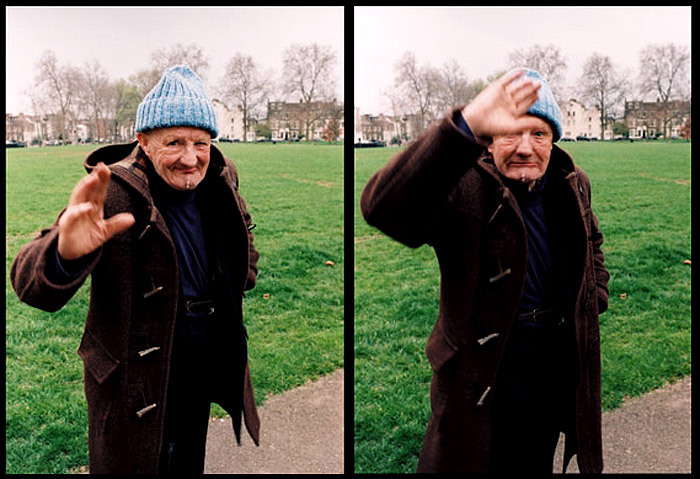 In 1998, he was interviewed by the BBC to mark the 40th anniversary of the Windrush sailing: the interview may be read here. He died in 2000; his Guardian obituary was written by Mike Phillips. 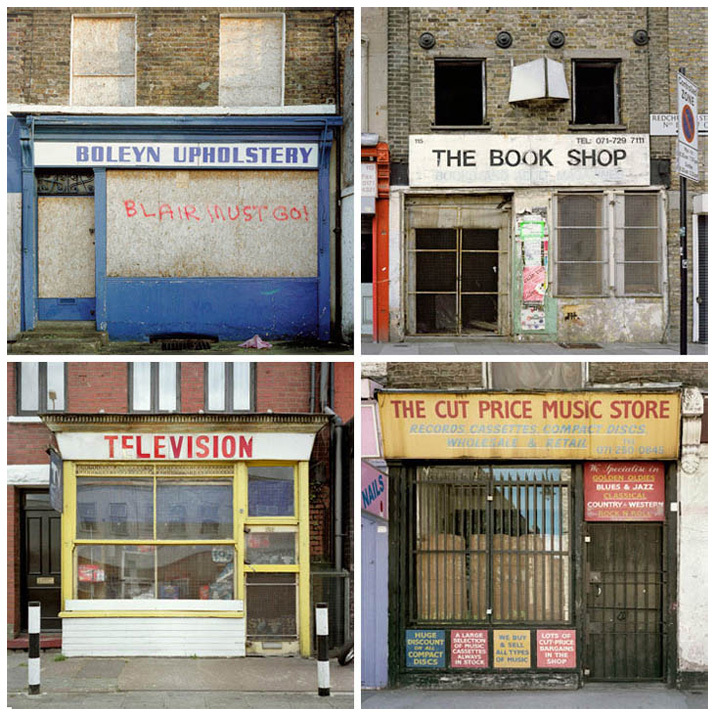 Posted: March 16, 2012 | Author: thelondoncolumn | Filed under: Dereliction, Shops, Vanishings | Tags: abandoned shops, Charles Jennings, Mike Seaborne, pre-corporate London | Comments Off on London Facades. Photos: Mike Seaborne, text: Charles Jennings.